Large-scale shrimp aquaculture can have major social and environmental impacts. Can community-based approaches be used instead? We examined three coastal community-based shrimp aquaculture operations in northwestern Sri Lanka using a case study approach. These shrimp farms were individually owned by small producers and managed under community-level rules. 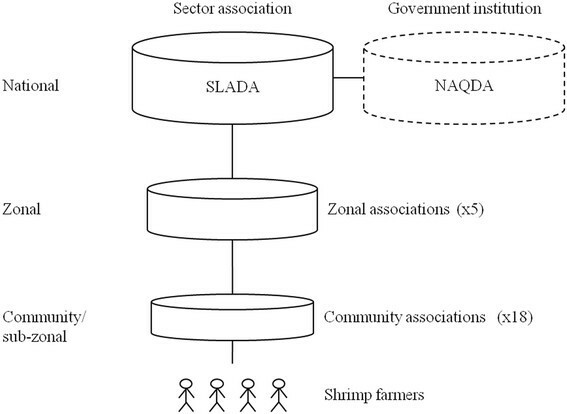 The system was characterized by three layers of institutions: community-level shrimp farmers’ associations; zone-level associations; and a national-level shrimp farming sector association. The national level was represented by a joint body of government and sector association. We evaluated the effectiveness of this institutional structure especially with regard to the management of shrimp disease that can spread through the use of a common water body. Lower operational costs make them a highly attractive alternative to large-scale aquaculture. In many ways, private shrimp aquaculture ownership with community-level institutions, and government supervision and coordination seem to work well. Can shrimp aquaculture be carried out through community-based institutions? And if so, can community-based aquaculture be considered a potential alternative to large-scale, company-owned aquaculture? Such questions have theoretical significance for commons management, and practical significance for sustainable aquaculture. We explore these questions based on coastal shrimp farming communities on the Indian Ocean in the northwestern part of Sri Lanka. The most common shrimp species cultured in these communities is the giant tiger prawn or Asian tiger shrimp (Penaeus monodon), a prime export species. Sri Lanka is not a big player in the global shrimp trade, and the operations in question have received little attention even in Sri Lanka itself (Galappaththi ). In terms of production volume and technology, Sri Lankan shrimp aquaculture sector is relatively small compared to other Asian countries (MFARD ; Anon. ). In most of South and Southeast Asia, shrimp aquaculture has a mixed history of social (Nayak and Berkes ) and environmental impacts (Bhatta and Bhat ; Primavera ; Huitric et al. ). Commercial operations are typically large-scale and company-owned. They have resulted in the destruction of coastal vegetation, including mangroves, that act as a buffer to protect coastlines from such disasters as tsunamis (Adger et al. ). Historically, shrimp aquaculture operations have often collapsed after a few years of profit-taking, often the victim of shrimp diseases as a consequence of concentrating such large numbers of one species. For example, Huitric et al. () tracked the rise and fall of large-scale shrimp farming in Thailand and around the Gulf of Thailand, leaving behind its wake collapsed farms and damaged land and waterscapes. However, in some areas, the collapse of large-scale farms creates the opportunity for the start of small, locally owned operations at the abandoned locations. Such is the case in the northwestern part of Sri Lanka, where the country’s large-scale shrimp farms used to be located and where the small-scale operations now exist. Sri Lanka’s shrimp production reached a peak in 1998 (Munasinghe et al. ), and then declined after a major outbreak of two virus diseases. In the place of large farms, numerous small-scale operations appeared over time, mostly family-level farms run by producers who had learned their trade by working earlier for the large companies. These producers patterned the new farms along the lines of agricultural operations, to take advantage of economies of scale afforded by community-based associations. These were associations that helped coordinate production, reduce pollution loads in the shared water resource (the key common-pool resource in this system), and functioned as a conduit of information between the farmers and the state. Community associations have been known to play a major role in managing small-scale fisheries throughout the world (Digby ; McCay et al. ). Although there is a growing literature on such associations in finfish aquaculture (Haque et al. ; Von Essn et al. ), there is very little literature on their role in shrimp aquaculture. Even within Sri Lanka, the small-scale operations that replaced the collapsed industrial shrimp aquaculture are little known, much less appreciated (U. Amarasinghe, pers. comm.). How does small-scale aquaculture work? How can individual ownership be combined with community level coordination? As Bush et al. () pose the question, how can small-scale shrimp farming techniques be integrated into a landscape level approach to protect mangroves and control water-borne shrimp diseases? In the context of aquaculture, the commons problem occurs due to overuse of environmental resources as inputs and the addition of pollutants to the environment as waste (Pa´ez-Osuna ). Solving the problem should start by addressing the two main issues related to commons management, the excludability problem and the subtractability problem (Ostrom et al. ). Based on these two characteristics, Ostrom et al. () define common pool resources as a class of resources for which exclusion is difficult and joint use involves subtractability. Controlling access to resources (the excludability problem) is addressed by the fact that the farms are privately owned. However, the private property regime is not ideally suited to deal with the subtractability problem when individual holdings are interconnected. Hence, rules are needed to reduce the impact of users on one another (Feeny et al. ). Where community institutions exist, common property regimes may be suitable for users as an arena in which to make and enforce their own rules. Such community-based management works in many coastal resource contexts in Asia and elsewhere (Pomeroy and Rivera-Guieb ; Berkes et al. ). It is based on the idea that local resource users have a greater interest in the sustainable use of local resources than do large companies and other non-local players (Ostrom ). For common pool resources, collective management can work better than pure government management or private management (Ostrom et al. ; Ostrom ). Where users are interdependent, collective action is more appropriate than individual action and more effective for problem solving (Ostrom ). This is where associations such as cooperatives come in. The International Cooperative Alliance defines cooperative as “an autonomous association of persons united voluntarily to meet their common economic, social, and cultural needs and aspirations through a jointly-owned and democratically-controlled enterprise” (ICA ; Amarasinghe and Bavinck : 389). They work best in societies which have traditions of collective management (Yamamoto ; Makino and Matsuda ; Amarasinghe and De Silva ). A cooperative functions as a local institution that can coordinate the response to the exclusion problem of commons, limiting access rights to the resource. It also deals with the subtractability problem, helping make and enforce local rules among the parties that have access rights, coordinating with government agencies and market institutions, and acting as an information broker (Beem ). Sri Lanka has a history of managing resources collectively in many sectors, including fisheries, aquaculture and agriculture (Amarasinghe and Bavinck ; Amarasinghe ). Historically, the Sri Lankan government has recognized and promoted “bottom-up” management through legislation aimed at developing and uplifting certain economic sectors (Anon. ). Many of these resources are managed by cooperatives that facilitate collective decision making (Degen ; Samarakoon et al. ). Even though not all associations discussed in this paper are formally constituted as cooperatives, they function like cooperatives, despite varying designations. However, the Sri Lankan literature on collective management does not include shrimp aquaculture carried out by community associations and cooperatives. The paper addresses this gap by, first, attempting to explore and understand how shrimp aquaculture is carried out by community-based institutions in northwestern Sri Lanka. Second, the paper discusses the evolution of small-scale shrimp aquaculture governance and the role of existing commons institutions. Finally, the paper explores the importance of community-based, small-scale aquaculture as a potential alternative to large-scale aquaculture. This paper is based on a qualitative research study conducted during 120 days of fieldwork in three coastal communities of northwestern Sri Lanka (Figure 1). The communities were Ambakandawila, Koththanthive, and Karamba, hereafter referred to as communities A, B, and C respectively. These three communities were selected to capture the entire process of shrimp farming operation within the available limited timeframe. During the field work period, the three communities were in different stages of the shrimp farming process. For example, during the month of May, community A was in the middle of farming; community B was in the harvesting stage, and community C was in the pond preparation stage. The management activities and focus of the community-level shrimp farmers’ associations varied according to the production stages of farmers in the community. For example, the main concern of community C was to finish postlarvae (shrimp “seed”) stocking prior to the deadline. Community A— which was in the middle of the shrimp farming stage—focused on protecting their farms from shrimp diseases. Community B was in the process of shrimp harvesting and preparing ponds for the next culture season. 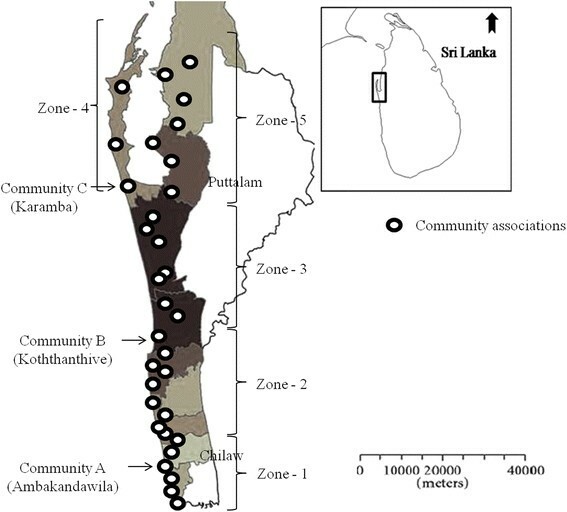 Study area: Three coastal communities (A, B, and C) in the northwestern Sri Lanka and the distribution of communal institutions (Community associations/ Samithies ). The research strategy adopted was the case study approach (Yin ). Primary data were collected through: a) participant observation; b) semi-directive interviews with shrimp farmers and the leaders of shrimp farming community associations; c) focus group discussions; and d) key informant interviews with influential people involved in shrimp farming. Data collection took place from April to August in 2012. The sample of farmers was selected using a snowball sampling technique. Thirty eight (38) shrimp farmers and community associations (A: 13; B: 11; and C: 14) were interviewed. Further, the data were validated through seven key informant interviews and three focus group discussions. The data from participant observations helped to obtain a better contextual understanding of the shrimp farming areas. During the field work, a couple of community associations, which did not belong to the study sample, also invited the researcher to visit and observe their meetings. Data gathered through participant observations and semi-directive interviews were documented immediately in the field. Analysis of findings began with the labeling and coding of data to help to distinguish differences and similarities. Mind maps and diagrams on concepts and, management processes, were developed based on the contextual understanding developed during field work. Insights and experiences gained through participant observation also helped the researcher to simplify the analysis process. Descriptive statistics (e.g., frequencies, percentages, average values) were used in assessing the background of community-based shrimp aquaculture in northwestern Sri Lanka. Microsoft Excel was used for data processing. Community A is located in the southern part of northwestern coastal area, close to Chilaw lagoon. This is a rural community with people of Sinhalese origin. At the time of research there were about 150 households involved in small motorized craft fishing, shrimp breeding (hatchery), and shrimp feed selling in addition to shrimp farming. Community B is located in the middle of northwestern coastal area on the Mundel lagoon. This is also a rural isolated community but with Tamil ethnic backgrounds. The size of community B is about 100 households. The main household income generating activities are: fishing; paddy farming; and government employment. Community C is located in the northern part of the northwestern coastal area, close to the Puttalam lagoon. This community has a mix of people with Sinhalese, Tamil, as well as Muslim origins. Salt extraction and coconut cultivation were the main household activities, other than shrimp farming. Almost all of the existing shrimp aquaculture operations in northwestern Sri Lanka are small-scale. The number of ponds operated in a farm can be considered as an indicator of the extent of shrimp farming. In 2011–12, 37 percent of the sampled farmers operated two to five ponds, whereas 11 percent operated just one pond. Twenty-nine percent and 18 percent of shrimp farmers operated five to ten and ten to fifteen ponds, respectively. Only five percent of farmers had more than 15 ponds. The size of the smallest pond was about 0.2 hectares whereas the largest was about 0.8 hectares. As of 2013, there were many abandoned shrimp ponds in the northwestern coastal area, and only about 45 percent of ponds is operational. Small-scale shrimp farmers do not invest money in the construction of new ponds; rather they use existing abandoned farms to reduce costs. Another indicator of the scale is the total land area of the farm (i.e., the full extent or the size of the farm), including the ponds which were being operated and rested. Fifty five percent of shrimp farmers had farming areas between one and three hectares in size. Thirteen percent of farmers had less than one hectare of land. Sixteen percent and 11 percent of farmers had farm areas between three and five and five and seven hectares, respectively. The recorded percentage of farmers with more than seven hectares of farm lands was five percent. Only the farmers from community C used more than seven hectares of farm land. Multiple reasons were given by the farmers for resting some of the ponds in their farms: lack of labor; relatively low profit margins and increasing cost; limited shrimp stocking capacity issued by the farmers’ co-operative; and pond disinfecting to reduce disease risk. Draining a pond and exposing it to sunlight presumably reduces disease risk. Shrimp farms were owned and operated by individuals, not by community associations or large private corporations. However, 53 percent of these farms were on government-owned lands without any compensation paid for using the lands for commercial purposes. There were unresolved legal issues mostly related to land ownership, and it seemed political influences were in play. Thirty-seven percent of farmers used their own private lands. The remaining 11 percent of farmers rented lands from shrimp farmers who had discontinued farming previously. Due to the high input cost of farming, the general practice of farmers was to minimize the number of employees as a way to reduce costs. In most cases, family members provided the labor needed. Involvement of family members in the farming operation was common. Seventy-four percent of shrimp farmers said they receive the support and involvement of their family members and/or relatives. Sixty four percent of them received support from female family members --wives, daughters, mothers, and/or other close relatives. These women were involved in shrimp farming in diverse ways: labor (shrimp harvesting); book keeping; day-to-day management activities; financial contributions towards farming; and community association activities. Complementing the individual/family-level farm ownership, community level farming activities were governed by community-level rules designed and enforced by the community institutions as a part of a multi-layered management structure. Shrimp aquaculture operations are managed under a commons regime consisting of three kinds of institutions: private; communal; and governmental. At the heart of this management regime is the shrimp farmers’ (or community) association, called samithiya in Sinhala. The distribution of community level associations in the northwestern part of the island is shown in Figure 1. These institutions are self-organized and formulate and implement their own rules. For example, community-level rules specify that a pond should not be harvested when shrimp are less than one month old or less than five grams in average weight (community A); water should not be released or pumped until the two month culture period is completed (community A; community B); and partial harvests are not allowed (community A; community C). Obtaining community association membership is a requirement for any person starting-up a shrimp farm. Community associations have collective authority and a high level of involvement in regulating and managing shrimp aquaculture. Elected officers of the community associations enforce the rules and assess penalties for those not conforming. Penalties vary from fines to denial of permit—a document issued by the community association required for carrying out shrimp farming during a particular crop season. Evolution of small-scale shrimp aquaculture. Multi-level structure of commons institutions. Most of the community associations consist of 20–60 members. Members pay an annual membership fee. The elected officials of a community association include: president, vice president, secretary, treasurer, and assistant treasurer. These officers have the authority to make decisions on behalf of the membership—a power granted through the collective agreement. However, the officials are also responsible for elaborating and adequately justifying such decisions during the upcoming meetings. The community associations collectively make decisions on the day-to-day regulatory operations related to community level shrimp aquaculture. For example, monitoring the application of proper management practices for shrimp disease prevention; inspection of ponds prior to issuing post larvae bill; and supporting members to obtain electricity connection to farms, are some of the major activities. Most of the associations have government aquaculture extension officers working closely with them to ensure that practices comply with national level regulations. However, the extension officers are merely observers and are not part of the decision-making. Collective decision making is one of the important characteristics of community associations. Moreover, community associations act as hubs for sharing information required for operations. These community institutions are inter-connected through zonal-level associations. Table 1 shows characteristics of the three community associations studied. One basic feature of shrimp aquaculture in the study area is the zonal system design introduced by the SLADAa (Sri Lanka Aquaculture Development Association) for the main purpose of managing disease. The shrimp farming area is divided into five main zones and 32 sub-zones. Some zones include just one sub-zone whereas the others represent up to eight sub-zones. If the number of farmers in a particular sub-zone is too small, then adjacent sub-zones are amalgamated to form a single association to represent a cluster of sub-zones. Leaders of sub-zonal associations represent the zonal association. All zonal and sub-zonal associations are collectively represented in SLADA with at least one representative from each zone and sub-zone. SLADA is the national level association, which represents all the direct stakeholders in the shrimp farming sector—farmers; hatchery owners; feed suppliers; and shrimp processors. This association was established in 2005 with an initial membership of 16 people. Later, zonal and sub-zonal community associations were allowed to become members, resulting in a total membership of about 50 (about 20 institutional members). SLADA is an independent body. Even though the main objective of SLADA is to develop the shrimp aquaculture sector, initially the mandate was not restricted to shrimp aquaculture. Development and planning of ornamental fish aquaculture and inland aquaculture were also included in the mandate. In developing the shrimp farming sector, SLADA appointed six committees targeting different subject areas, such as environmental protection; hatchery development; and shrimp farm development. Moreover, SLADA and NAQDA (National Aquaculture Development Authority)—the government line institution responsible for aquaculture development and management, which falls under the of Ministry of Fisheries and Aquatic Resource Development in Sri Lanka —jointly developed a technical advisory committee representing expertise from local universities and research institutes. In 2006, SLADA was legally registered as a corporation by the members themselves (Figure 2). Evolution of small-scale shrimp aquaculture in northwestern Sri Lanka is related to the collapse of large-scale shrimp farming operations, the management approach, government’s involvement and impact, and the management of the key common-pool resource, water. Figure 3 illustrates the evolution of shrimp aquaculture from the 1970s to 2012. In the late 1970s, shrimp aquaculture in Sri Lanka started off as a commercial-scale venture. Initially, the farms were geographically limited to the eastern part of the country (Batticaloa District) and only four companies (Carson, Enris, Lever Brothers and Andrew’s) were in the industry. To begin with, all the operations were done in an integrated fashion, whereby shrimp breeding (hatcheries), farming, and processing, as well as exporting activities were managed by the same company. According to the respondents, some farms were as large as 150 ha in area with hundreds of ponds. At the time, these companies reportedly earned attractive profits. The information related to culture systems, input supply, and marketing were accessible only to a few stakeholders attached to these companies. During the early 1980s, the profit making potential of this new industry attracted investors such as politicians, bank managers, and wealthy business owners. At the same time, some of the employees of these pioneer companies started their own farms in eastern and northwestern provinces. Later (in the 1990s), the government intervened by promoting shrimp farming as a profitable self-employment opportunity among locals, leading to many other community-level small-scale farmers entering the industry. As a result, farming area expanded over the northwestern part of the country. Small-scale farmers conducted their operations within their community areas, while large and medium-scale farmers shifted from place to place by converting mangrove forests (Gunawardena and Rowan ) and coconut plantations into shrimp farms (Cattermoul and Devendra ). However, the expansion of aquaculture into the eastern part of the country was restricted due to the civil war that was taking place. During this time, there were outbreaks of three viral diseases. The first major disease outbreak Monodon Baculo Virus (MBV) came in 1988/9. The second major disease outbreak was the White Spot Syndrome Virus (WSSV) in 1996, followed by a third outbreak in 1998 with both WSSV and Yellow Head Virus (YHV). Most of the pioneer companies shut down operations a result of these outbreaks. As of 2012, almost all the 600 shrimp farms in the northwestern Sri Lanka are small-scale operations. Large or medium-scale shrimp operations have not survived under disease conditions. As documented earlier, the average size of a shrimp farm is small compared to the operations that took place at the beginning of the industry. The type of management system found in the 1970s and 1980s was a corporate-based management with four large multi-national companies controlling the industry. However, the decline of corporate shrimp farming during the 1990s created space for small-scale operations with their own associations. This is the era of emergence of community-based institutions across northwestern Sri Lanka. Community associations were registered under different legislations/authorities such as the Cooperative Act, divisional secretariat offices, and most recently with government institutions like NAQDA. Before 2003, there were no governmental, technical or other controls over shrimp farming activities. Resource management activities were mostly limited to self-managed community-level associations, even though these associations were not recognized by the government. There was neither any proper linkage between farmers and government nor proper management over shrimp aquaculture production and quality. For instance, there was no specific timeframe for stocking shrimp postlarvae. Shrimp farmers and hatcheries continued production throughout the year, and people were free to enter and leave shrimp farming whenever they wished. Until 2003, government involvement in shrimp aquaculture was minimal and was mostly restricted to divisional and provincial level general administration, and research on water quality of the northwestern lagoons. The direct involvement of the central government in the shrimp aquaculture sector started in 2003/4 through NAQDA. This action led to many changes in management, resulting in a collaborative management approach. NAQDA’s approach was to work in collaboration with SLADA and community-level shrimp farmer and breeder (hatchery owner) associations. Initially, it was not easy for the independent-minded actors in the sector (especially shrimp farmers and breeders) to adjust to the new management system, as they were skeptical of the purposes behind government involvement. Design and introduction of the zonal crop calendar system in 2005/06 was one of the initial tasks of SLADA and the individual community institutions. The crop calendar system emerged out of a study conducted by a few of the founding members of SLADA with previous experience and knowledge of aquaculture. The study report recommended management that involved the development of a zonal crop calendar system. This crop calendar system was initiated by SLADA in collaboration with NAQDA. The calendar system was designed to limit farmers accessing common water bodies through a schedule or timetable leading to a major change in the way farming operations were conducted. Under this system, farmers were not allowed to access the water bodies at any time but only during a particular period when all of the community farmers of a subzone could access the same water body. The initial reaction of shrimp farmers and hatchery owners was to resist, mainly because the crop calendar limited the production cycle (number of crops per year). Moreover, the introduction of new standards and quality improvement measures targeting shrimp farms and hatcheries led to social conflicts between shrimp farmers/hatchery owners and NAQDA. Adoption of these measures required costly physical infrastructure changes such as construction of chlorine baths at farm and hatchery entrances to control disease spread. NAQDA field extension officers were tasked with monitoring these standards by visiting farms and hatcheries. However, these officers at times were not allowed to enter farms and hatcheries—and there were reported incidences of serious verbal conflicts and even physical harassment. During the first few crop cycles under the new zonal crop calendar system, some relatively large-scale shrimp farmers and large-scale hatchery owners in Sri Lanka left the industry as it was not profitable to maintain their farms and hatcheries in an idle state during parts of the year as they still had to incur costs in terms of salaries and fixed costs such as maintenance. The overall effect of these changes was a decrease in national shrimp aquaculture production after 2003. However, farmers and hatchery owners who remained in the sector experienced a very successful crop year after the introduction of the zonal crop calendar. Farmers had a good harvest due to reduction in disease (fewer infected ponds), and hatchery owners received a good price for postlarvae. After realizing the success, some farmers who had left earlier, joined again in the following season; however, the next season was not as successful, in part due to lower market prices. During the period, 2006 to 2009/10, there were ups and downs in terms of shrimp production. People started to think that the white spot disease had been eradicated, but it returned from time to time. Most of the medium-scale farmers also left farming due to the uncertain nature of production and significant increases in costs of labor, fuel, and chemicals such as chlorine. Although small-scale farms were affected by the same factors, small operations tended to have less operational and financial risks, mainly due to use of family labor. By this time, the majority of farmers and hatchery owners had adapted to the new crop calendar system. NAQDA, with the support of SLADA, further strengthened the existing community associations while establishing new associations in certain other communities. NAQDA’s aquaculture field extension officers were able to visit farming communities without any problems, and NAQDA itself became more flexible after their experience. Some illegal activities such as shrimp postlarvae stocking and releasing disease-infected water into the natural water body, still occurred, but NAQDA and SLADA are able to take action against these activities with the support of community-level associations. Shrimp aquaculture management system became well established as a result of these changes. Based on the SLADA report recommending a crop calendar system, different tasks were assigned to different levels of management. Community (primary) associations regulate community-level farming practices with the support of NAQDA field extension officers. For this purpose, there is a shrimp farm monitoring and extension unit in Battulu Oya established in 2008. It is the responsibility of second-level zonal associations to develop the infrastructure of shrimp farming areas in collaboration with divisional secretariat offices and provincial councils. Maintaining links (mainly communication) between the different management levels is also the role of zonal associations. Finally, the role of top-level management (SLADA and NAQDA) is to develop an effective national-level shrimp aquaculture system. Shrimp farms take water from a common source at the beginning of the production cycle and discharge used water at the end of the cycle, after shrimp have been harvested. Almost all the shrimp farms in the northwestern area are directly or indirectly connected to single water bodies, mainly via a canal that connects them (the Dutch canal) and the lagoons. Puttalam lagoon (28,000 ha), Mundal lagoon (3,600 ha), and Chilaw lagoon (700 ha) are the three main lagoons connected by the Dutch canal. Kala Oya, Mi Oya, Daduru Oya, and Maha Oya are the four main rivers connected to this system. The interconnected nature of this common water body makes the shrimp farms susceptible to shrimp diseases. Hence, one of the major tasks of the aquaculture management system is to control the spread of disease. Wetland ecosystem biodiversity and ecosystem services such as water filtration through mangroves may also have a role to play in this regard but their importance has not been investigated. Regarding the common water supply as the key resource, the excludability problem (Ostrom et al. ) is addressed by community associations with their own rules to exclude outsiders from shrimp farming in their communities. This is accomplished in two ways. First, the community association organizes the membership and oversees how and when the members access the water source at the given time period, as specified by the zonal crop calendar (main aim is to control the spread of any diseases). Second, if an outsider wants to start shrimp farming in a particular community, attending association meetings for a minimum period of six months is mandatory to be eligible for membership. This rule is in place to discourage community dwellers/outsiders, who intend to start shrimp farming, from moving from one farming location to another within a short period of time, i.e. relatively irresponsible shrimp farming. This rule also ensures that the prospective members understand how shrimp farming operations are conducted within the community in a collective manner. The subtractability problem is associated with the release of waste water into the common water body. If a particular pond is disease infected and if the farmer releases contaminated pond water to the common water body, there is a high probability for disease spread into other farms. Disease cannot be completely eradicated but it can be controlled. Constant vigilance and monitoring by farmer families themselves make early detection possible to deal with shrimp disease. If an outbreak is caught early, shrimp can still be harvested quickly and sold. Large-scale shrimp disease problems, such as those that led to the demise of the aquaculture companies in the 1990s, mainly occur when uncontrolled amounts of disease-infected water are released into a common water body. By limiting the amounts of waste water and staggering the times of release, the zonal crop calendar system reduces the incidence of disease, and helps farmers to control infections. Compliance is monitored and managed by community level associations making use of their own rules. These rules are implemented by the collectively elected officers of community associations, and enforced by higher level authorities as appropriate. According to Gazette number 1536/12-(February 13, 2008), shrimp can only be farmed in compliance with the crop calendar. To operate a shrimp farm, farmers must obtain a permit from NAQDA (as specified in Gazette number 1677/7-October 25, 2010) issued under the consent of the community association. Punishments for free riders have been specified depending on the severity of the violation and range from fines paid to the community association to court cases filed by NAQDA. Most of the commercially managed aquaculture operations in South and Southeast Asia are large-scale, corporate-based industries that often produce negative social and environmental impacts. Unsustainablity of large-scale aquaculture is well documented, but there have been some major attempts to make them more sustainable (Primavera ; Bush et al. ). Many large-scale aquaculture operations are known to move from one area to another, in order to avoid disease. Large-scale aquaculture tends to make its profit during the first few years, with the expectation that they can move onto another area, rather than aiming to establish sustainable practices and remain in one area (Huitric et al. ). A mixed governance regime that combines private ownership with community-level commons institutions, which deal with exclusion and subtractability problems. A management system that is able to limit and control the release of waste water, minimizing its environmental impact and the transmission of shrimp disease. Small-scale operators have low overheads and low operating costs, as family members work in the farm. A close relationship with aquaculture ponds, allowing for constant monitoring by farmer families themselves for shrimp disease. There are relatively small net losses even under disease conditions, since disease detection is fast and the potential for limiting economic damage is relatively high. This is because the shrimp can still be sold at market prices, if disease is detected at the initial stage. The social enterprise nature of small-scale aquaculture, whereby operations are based on an economic model in which resources provide for broader goals, such as improving human and environmental well-being, rather than merely maximizing profits for external shareholders (Ridley-Duff and Bull ). Competition over scarce resources is a common phenomenon throughout the world, and interactions among users tend to be competitive. However, in the context of small-scale shrimp aquaculture in Sri Lanka, farmers co-operate to overcome common challenges, such as disease. Such cooperation is not common in the world of free enterprise, and as Bruno Dyck (pers. comm.) pointed out; it can be considered as a different way of doing things, even a different worldview. There seem to be two major factors that shape the operations of Sri Lanka’s small-scale aquaculture producers. First, shrimp farmers are empowered by their experience having worked for the old (and failed) aquaculture companies; they constantly apply this knowledge (stocking, growing and harvesting shrimp) to the practice of their small-scale operations. Second, starting at the local level, multi-level commons institutions have been developed by shrimp farmers in cooperation with the government, for commons management (Berkes and Davidson-Hunt ). These commons institutions function collaboratively, using a participatory approach. There are no formal co-management arrangements with the government. However, small-scale aquaculture, as practiced in Sri Lanka, functions like co-management because it involves shared decision-making between government and producers. The overall system is a hybrid regime of private, communal, and state commons management, in which government devolves certain powers to other parties. 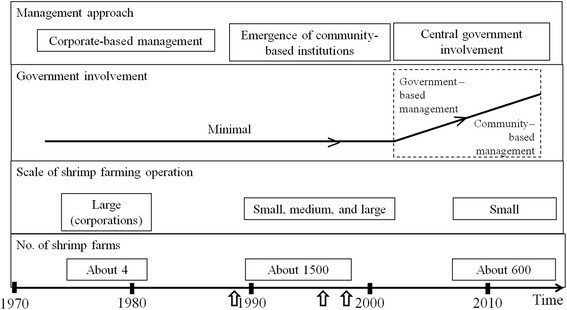 The evolution of this commons management model, which dates back to 1990s, has been relatively rapid and has taken place under certain historical conditions. The community-based shrimp aquaculture management system in northwestern Sri Lanka seems to have evolved to its current state under the influence of two major drivers. The first is the tendency of large aquaculture operations in Sri Lanka in the 1970s and 1980s to develop disease. Shrimp disease problem is a key factor in the demise of large operations in general (Bush et al. ). Disease spreads through the interconnected water bodies, which tend to be controlled centrally in large-scale operations, but separately in small-scale operations through the zonal crop calendar system. The second driver is the ability of Sri Lankan producers to use collective approaches. There is a historical and cultural tendency in Sri Lanka towards a collective approach in managing and sharing resources (Gunawardena and Steele ). Backbone of the community-based shrimp aquaculture management system is multi-level commons institutions. These institutions have been developed by shrimp farmers themselves, in cooperation with the government. This bottom-up multi-level institutional structure is effective in managing small-scale shrimp aquaculture management. Small-scale shrimp aquaculture owners are families. Their operations are owner-managed under community-level institutions, with government supervision and coordination. This private-communal-state mixed regime appears to be a viable alternative to “big aquaculture”. The current (as of 2013) small-scale shrimp aquaculture systems in Sri Lanka are by no means perfect. Shrimp farmers deal with new problems on a daily basis and constantly argue among themselves in local associations. As new challenges appear, they debate new approaches. The present management system will likely continue to evolve in the face of numerous changes in the social-ecological system into the future. However, the recent historical experience with northwestern Sri Lanka shrimp aquaculture systems suggests four lessons: (1) Small-scale shrimp aquaculture operations have been able to survive in an environment in which large-scale ones have not; (2) this has been mainly due to the ability to control the spread of disease under the recent management regime for small-scale shrimp aquaculture; (3) the mixed regime (private-communal-state) commons management model with multi-level institutional linkages has been effective in providing private incentives, community-level rules and government coordination and oversight; and (4) continuous learning and adaptation, such as adjusting the crop calendar from year to year and combining farmer knowledge with government technical knowledge, has provided a pathway to economic sustainability. The present study is significant for several reasons. Even though small-scale community-based shrimp aquaculture practices exist elsewhere in the world (for example in Thailand, Berkes, unpublished field notes), it seems that they have not been documented or studied. The present study attempts to shed light on this area by confirming the existence of community-based operations and by providing evidence that such operations seem to be viable. Further, the study suggests that the comparatively lower environmental and social impacts of these operations make them highly attractive as an alternative approach. Principles and practices of Sri Lanka’s community-based management system provide lessons in multi-level governance that may be applicable to other aquaculture operations. We thank the shrimp farmers of northwestern Sri Lanka, and gratefully acknowledge Rohan Paaris from the Sri Lanka Aquaculture Development Association for his invaluable support and guidance extended during the field work period. We thank Upali Amarasinghe (University of Kelaniya, Sri Lanka), Bruno Dyck (University of Manitoba), and Iroshani Tennakoon (Manitoba Health) for help and for sharing valuable thoughts and experiences in this field. FB drafted substantial portions of the introduction and discussion sections of the manuscript. He also revised some of the critical intellectual content and the content flow. Both authors read and approved the final manuscript. MFARD. 2011. Ministry of Fisheries and Aquatic Resource Development of Sri Lanka. Sri Lanka:. Accessed 14 May 2014., [http://www.fisheries.gov.lk/].